It is said democracy is alive if people have freedom. When the wants, demands and requirements of the people are not met, despite requests and representations to the rulers, then the available recourses for them include agitation, protests and satyagraha to force the government to fulfil their demands. One resorts to satyagraha and agitations usually for demanding basic needs like roads, drinking water and increase in salary. Of late, even satyagrahas are being sponsored. It is then called ‘paid satyagrahas’, wherein political parties sponsor them to weaken their opponents by bringing ‘paid’ people. Recently a unique mass movement took place in Karnataka to force the government to implement total prohibition. This self-sponsored movement was unique in the sense that everyone participated on their own to put an end to this social evil. This satyagraha did not have any leader, no political party sponsored it, no vehicles were provided to bring people and no food packets were distributed. On 19 January 2019, people from across the State assembled at Chitradurga, about 200 km from Bengaluru. 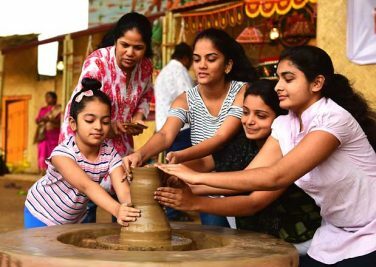 The participants were mainly women who had come from across Karnataka to participate in the agitation of making the State liquor-free. 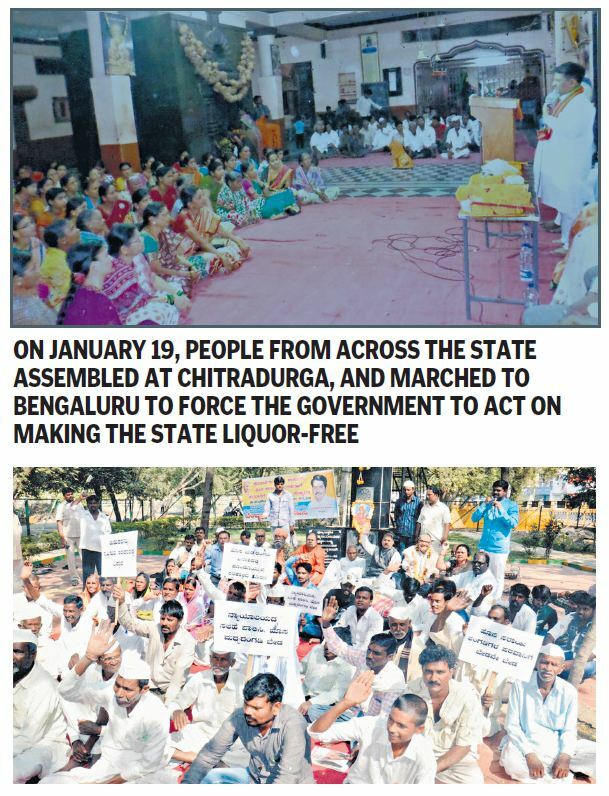 From Chitradurga, they decided to undertake padayatra up to Bengaluru to represent and force the government to act on making the State liquor-free. The 11-day padayatra, covering 200 km, made many weak yet the steely resolve ensured that they did not drift away from their goal. Many had brought food along with them, some purchased on the way and a few even begged when hunger struck them. Every participant had her own story to share. They had a drunkard husband, a son or a father who did not earn anything but forced the women of the house to part with her earnings to buy alcohol. They beat them up and snatched money when denied. Saroja, a participant, said her father quarrelled with her mother every day and beat not just her but also everyone in the house. 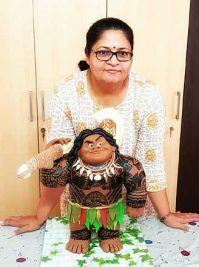 Her mother worked as a coolie to run the family. Her father never enquired in which class Saroja was studying, whether she had books and notebooks. Nilavva (70) had come from Bagalkot, over 300 km from Chitradurga, to participate in the ‘satyagraha’. She had four boys but alcohol claimed two of her children, and also her husband. Her life for the past 50 years was just pain and torture. She had suffered silently all these years but has now decided to revolt and put an end to the menace. There is another story of a crusader. Chandrashekhar Hiremath is a one-man army from Aland taluka, bordering Maharashtra. The 51-year-old Brahmachari and a social activist is spearheading a movement to make Aland a ‘Madhya Mukth’ taluka. Hiremath had brought together heads of religious institutions, freedom fighters, social activist, women volunteers and many others. They all move from village to village creating awareness about the evils of alcohol. It is to be noted that Aland taluka, situated in the most backward district of Kalaburagi, has about 450 illegal liquor shops spread over some 140 villages – perhaps the highest in the State. Here liquor is sold in panshops, tea stalls, kirana stores, stationery shops and even in houses. So much so that if you give a missed call from your mobile, liquor is even served at your doorsteps. The liquor baron here is a political heavyweight, his political opponents join on the same page by collecting ‘hafta’. The campaign of Hiremath is attracting a large number of women and youth. The results are gradually showing — liquor sale has slowed down in this taluka. Usually, youth have their first taste of liquor during elections. It’s the time when liquor is distributed free of cost and it goes without saying that anything free appears attractive. The youth get hooked on alcohol right from the date of announcement of elections till the polling day — ie, for about 25 days when it’s free and non-stop. To add to the woes, we now have elections at least once every year, including Parliament, Assembly, local bodies, gram panchayat and co-operative bodies. Hence, getting youth addicted to alcohol is not difficult, and this menace only spreads and catches on with time. No government has ever thought of bringing prohibition or acting tough on it. This is for the simple reason that the Excise Tax gets them a revenue of around Rs 40,000 crore annually. It is alleged that the Excise department collects money from illegal liquor activities and this money goes even to many political bosses. All major political parties in Karnataka have former excise bigshots as MPs, MLAs and Ministers. Little is left to doubt when we see illegal money, illegal businesses flourish. The neighbouring States of Kerala and undivided Andhra once had total prohibition. Karnataka never dreamt of it, none of the political parties in their election agenda assures people of imposing prohibition as liquor barons are the biggest financers during elections. But all hope is not lost. Like all evils have an end, this may also see an end. And, the innocent people of Karnataka are eagerly awaiting that day.